Australia's rum capital is not what we'd typically expect to be a mecca of creative talent, but this exhibition sure changed our minds! It features work from a handful of talented Bundaberg artists who want to dispel the town's reputation for noisy yobbos boozed up Bundaberg's brown liquid namesake. Showcased here is an eclectic mix of mediums from traditional acrylic on canvas, to a quirky mix of flamingo-pink latex and astro turf, and even a series made nearly entirely of tape that bears mysteriously religious (and feline) connotations. Though united through their Bundaberg citizenship, the eleven accomplished artists behind this exhibition range from those with years of experience and international shows under their belts, some emerging, and even one debuting artist. While we were pretty late getting to this one and missed Friday's opening night (shame on us! 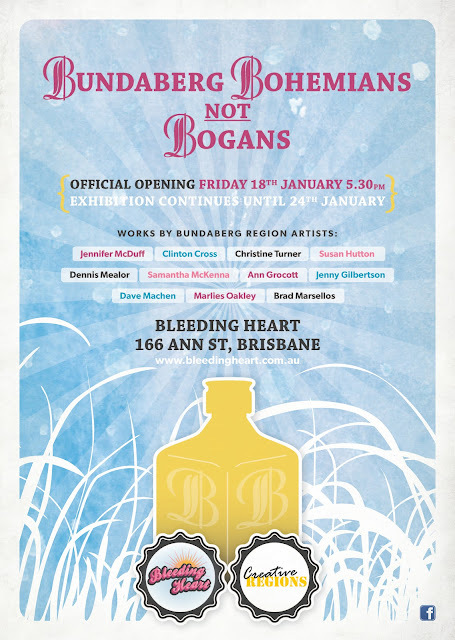 ), it's open at the very relaxed Bleeding Heart Gallery at 166 Ann St until Thursday 24 January at 5:30pm. Duck in, grab a coffee and take a look!